Whoa, is that a YETI? Your new favorite swag has arrived. It’s nice to offer a promotional or giveaway product that is in high demand, and it’s also nice to find one that is used in the workplace — that is, a product used where B2B customers make their buying decisions. Custom YETI cups & tumblers are in high demand, and your prospective clients often use them while sitting at their desks in the morning. For those reasons (and many others), custom YETI cups & tumblers are among your best options when searching for the perfect promotional or giveaway item. Here’s a look at just a few of the many reasons why you should closely consider custom YETI mugs and custom YETI tumblers when searching for promotional and giveaway items. Coffee consumption has been on the upswing for decades, thanks in large part to the emergence of specialty coffee shops like Starbucks. In fact, the number of Americans drinking a daily cup of coffee reached a six-year high in 2018. In short, we love coffee. Which is why there is such high demand for custom YETI coffee mugs and other Yeti products. Yeti has perfected the on-the-go coffee container. Not only do custom YETI cups & tumblers keep beverages warm for unusually long periods of time, but they also protect hot beverages from spills and leaks. This is good for two reasons. First, there’s no danger of burning yourself with spilled coffee. And, second, there’s no danger of losing a single drop of your hot beverage. Yes, we love coffee. But we also love tea and an assortment of other hot beverages, each of which custom Yeti mugs & tumblers take great care of. There’s a huge demand for products like custom YETI mugs & tumblers, and choosing custom YETI coffee mugs for your promotional or giveaway products helps to meet that demand. There’s high demand for custom engraved YETI cups & tumblers, and there’s also daily need. Think about your daily routine. How many products do you actually use each and every day? The list is likely short, but surely it includes the container from which you drink your daily dose of caffeine. Now think about the objective behind promotional and giveaway products. You want to find items that put your branding in front of a target market as often as possible. What could be better than putting your logo and brand in front of prospective customers each and every day? That’s exactly what you get when you choose custom Yeti cups & tumblers as your promotional or giveaway item of choice. Brand custom YETI coffee mugs appropriately, and the recipients of your mugs won’t be able to get your brand off the mind or out of sight. There’s an added bonus to custom YETI cups & tumblers that some people may not realize: They are items taken into the workplace, which makes them perfect for B2B companies. Here’s an example: A title company creates custom YETI coffee mugs and gives them to real estate agents all over town. Then, when sitting at their desks making title company recommendations and decisions, which title company’s brand will be staring those real estate agents right in the face? And it’s not just title companies that could benefit. If you work for a company that wants to do business with other companies, promotional and giveaway items that are used in the workplace are ideal. That’s not to say B2C companies do not benefit from choosing custom Yeti mugs, custom YETI tumblers and custom YETI ramblers as promotional items. 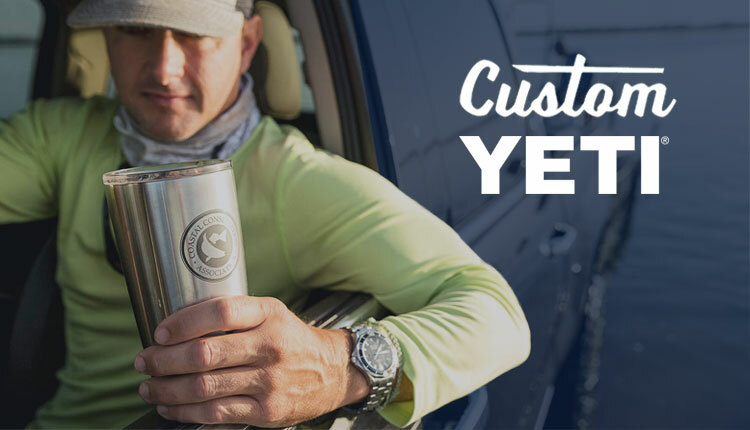 Consumers often make buying decisions as they shop online during the workday, so there’s a huge benefit to B2C companies choosing custom YETI cups & tumblers, too. The YETI company was created by two brothers, both avid outdoorsmen, who were frustrated by the quality of coolers available on the open market. They set about to create the perfect cooler, and then they extended their brand to include similar products — like cups & tumblers. YETI has grown in the years since its inception, and it’s become wildly popular both for people who spend time outdoors and those who do not. In fact, YETI’s success has led to a slew of copycat companies that offer similar products that simply do not match the high quality standards that YETI is known for. When you choose custom YETI cups & tumblers for promotional and giveaway items, you’re choosing the best of the best. Keep in mind that the items your company gives away with its brand on them serve as reflections of the quality of your brand’s products and services. Choose a YETI copycat, and your products and services may have a lower perceived value. But choose the quality that Yeti is known for, and you will align your company’s own products and services with a well-known brand — which helps recipients perceive your products and services as quality, too. This range of options gives you the power to choose a product that meets your company’s needs and that reflects your brand in a way that meets your company’s objectives. For example, sometimes a custom engraved YETI tumbler positions your brand where you want it to be, while other times custom YETI ramblers work best. No matter what you’re trying to achieve with your promotion or giveaway, you’ll find that a good selection of custom YETI cups & tumblers offers the perfect solution. Here’s something that companies appreciate: the ability to order in small quantities. You don’t always need to order 100-plus custom YETI coffee mugs or custom YETI tumblers. When you find a high-quality provider of custom YETI cups & tumblers, you can often order in quantities of 20 or smaller. At iPromo, we allow customers to purchase custom YETI cups & tumblers in quantities as small as 12. This brings the power of customization to even the smallest of businesses. If you do have a larger company with demand for more, you can enjoy a price break for ordering larger quantities of custom YETI Mugs or custom YETI Colsters. But we firmly believe that all businesses should be able to choose custom Yeti cups & tumblers as promotional and giveaway products, and we offer all companies the ability to do so. Let’s not forget the most important part of a promotional or giveaway product — highlighting your brand. Custom YETI cups & tumblers are ideal for highlighting your brand, giving you a perfect canvas on which to paint your branding. Given that you can order YETI cups & tumblers in smaller quantities, you can also choose more than one approach from the list above. You can order custom YETI cups & tumblers with your logo on them, and you can also order several that help to commemorate an annual meeting or event. There’s really no shortage of options when you think of all the ways you can mix and match YETI products with different branding approaches. And it’s nice to have options when you’re planning a promotion or giveaway. Rather than feeling forced into a specific product by the ordering requirements or what’s available, you can customize your promotion or giveaway and create a product that helps your company meet its objectives. Where can you find custom engraved YETI mugs, tumblers, ramblers and other products? At iPromo, our specialty is connecting companies of all sizes with the products needed to make their promotions and giveaways successful. High-Quality Products: These aren’t YETI knockoffs you’ll find in our inventory. These are the real-deal custom YETI cups & tumblers that are in high-demand and that will appropriately reflect your brand and your business. Various Options: We have plenty of options to choose from, which means that you can craft the promotion or giveaway that you’ve been envisioning for your business. Small Order Quantities: Order in quantities as small as 12. We want to provide access to promotions and giveaways that include custom YETI cups & tumblers to companies of all sizes. What type of promotion or giveaway are you planning for your business? If you’re looking for the right product to help your project meet is full potential, browse our selection of various custom YETI cups & tumblers. Check out our selection of custom YETI cups & tumblers today.